There hardly would be any workplace that doesn't reek of sexism. No, I'm not talking about sexual harassment. Nor am I talking about the income parity. Those are reserved for stand alone posts. I'm talking about sexism in general here. I've finished a decade of my corporate life within the same company and I'm proud to say that I work for a company where more than 50% of the workforce are women. How many of them make it to the top rung I'm not sure, but the current CEO and chairperson is a woman and I'm incredibly proud of that fact. How many of us can say that we work in a company run by a woman and be proud of it? Well, I surely can. Fortunately, I haven't had that many unpleasant experiences when it comes to dealing with sexism at the workplace. It probably is because I am known to speak my mind and give it back to people as and when a situation arises. I firmly believe that sexism at the workplace has nothing to do with the place in general but it has everything to do with the people in the company and their mindsets. As a major IT company employee, I've worked with people from every walk of life and probably from every part of the country as well. I've met quite a lot of educated men who believe that a woman has no business in the IT space. She's a woman, how much can she know is the expected norm. When the same woman rises up the ladder, she is accused of providing "other" favors for those who decide on the promotions and recognition. Why can't a woman just let be? Everyone is here to earn their own bread and butter, how does the gender of a person come in to picture in such a scenario? Some men actually think that women are just paid for actually walking into the office and warming their seats day after day while the "real" work is done by them. I've worked in multiple teams over the past ten years and in most places the whole team was spearheaded by a woman manager or a woman lead. The projects were hugely successful and at the end of the day that was all that mattered to us. After I got engaged, I decided to change my project and went in for many project interviews. I know I'm technically strong and pretty good at other professional skills as well, but sadly at a couple of interviews the only thing that was the focus, was the ring on my finger. Here's how one of my project interviews went after I had spoken about my experience in the company so far. Interviewer: I see a ring on your finger, are you going to be married soon? Interviewer: So, you will be going on a long leave then? Me: Yes, as per the company policy, 3 weeks. Interviewer: After marriage it will all be about adjusting to a new house and new environment. Plus, it is all about the additional duties and responsibilities. The focus on your work will reduce. We are in the middle of a release now and we cannot afford that. Me: I still have a couple of months to go before I get married. Also, I don't think I'll let anything else take over my work. My work has and will always be my priority. Interviewer: Okay, thanks. You can leave now, we'll get in touch with you. Of course they didn't get in touch with me after that. I didn't know that this would ever matter, until it happened. Also, what shocked me the most was that the interviewer was actually a woman! A couple of years ago, I was asked to be a part of a discussion about women and their careers. During this event, there was a graph that showed that a woman starts her career at the age of 22. She continues to rise up until the age of 28 and then there was a straight drop. Since none of the other women present cared to ask about it, I did. The response was that, that is the usually the age when a woman gets married or has a baby, so her career doesn't take flight after that. I was in a room full of women and hardly any woman decided to speak up against it. I was exactly 28 at that time and I knew that I had an impending promotion, so I told them that I refuse to believe it. Then I was in for a major shock. Most of the women in the room spoke up saying that they themselves have denied promotions with the fear of not being able to give time to family and children if they climb up the ladder. "I did not want to take on added responsibilities", one said. "It made no sense to accept a promotion when I know I would not be able to do justice to it", said another. This saddened me. I personally have given up a lot in my personal life to focus on my professional life and this will always be the case. Nothing can ever take precedence over work for me, but in a room filled with women burdened with the responsibilities of children or aged parents and in-laws, my point would not have made any sense. So, I let it be. I'm a part of the tech panel at my workplace and I conduct interviews on a regular basis. 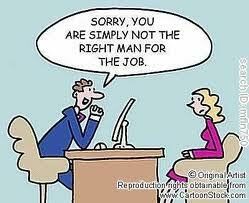 Most of the men on the panel prefer to hire men because as per their logic, "He's a guy, he can work late nights if needed". When it comes to hiring an unmarried girl, it is "She's take a long leave if she has to get married and then focus on the marriage rather than work". When it is a married woman, it is "She'll be worried about her children all the time. Her family will matter more to her, right?". Can a woman ever win in such cases? In the duration of my career, I have lost count of the number of times I've been woken up from sleep in the middle of the night to look at issues, I've spent innumerable sleepless nights at work, I've canceled vacations and missed family occasions on account of work. And you know what? I do not regret it one bit. If I had to, I would do it all over again. Now tell me one thing? Is the responsibility of taking care of a family only that of a woman? Is a woman expected to single-handedly shoulder the responsibilities of bringing up a child? Can't a woman be looked as a good leader/manager/technical person first and then as a wife/mother/daughter-in-law? Why do women themselves feel that they are not made for greater things? You do not have to sacrifice yourself and your dreams to show your family that you love and care for them. When you work for a big multinational company with a huge number of employees, promotions are hard to come by. But when you have to deny it owing to self-doubt, it should hurt. Such women are setting a wrong example for the ones who come in after them. Such women are unknowingly promoting sexism at the workplace. I currently work in a team where more than 80% of the population are women and we work together beautifully. But, I do see quite a lot of them taking offs or working from home when it comes to taking care of their children and this happens quite frequently. Since I'm not a mother, I don't know how this works, but I do think that fathers and other members of the family should pitch in too in such cases. Most women do it without complaining knowing very well that their work is suffering, but they still think that the duty to their family is more important than what happens at work. I guess this is a very personal choice, but when there is an audience out there waiting to say "See, that's why we shouldn't hire a woman", things like these should be given a little extra thought. Having said that, no where it is mentioned that a woman who cares for her family neglects her work. She might be more than capable of doing it both, but will anyone give her credit for it? I see and admire women around me who manage roles at work and at home very well. While I see some of them fighting it out and getting recognition, I also see many of them who are happy staying in the background. Who is to blame here, I don't know. What I do know is that if we women work together and believe in ourselves and in each other, we can remove sexism from the workplace. We need to empower, support and uplift one another for this. How many of us are willing to do this? Whoa; I could garner a few facts about you and my liking went up a few notches higher Somz. Way to go on being that strong and "outspoken" woman at work place! Its great you have a voice and you use it speak for yourself. Sad about the women not wanting promotion but honest atleast in the fact that they felt they wouldnt do justice to it. I need to speak up to get things done. Sadly, the world is that way. Hi Soumya, I am regular follower of your blog and love your points. I have something to say here. I am an IT professional with 10 years of experience, a loving wife and a mother of 2 year old. I love my work and at the same time I love my family too. And am proud to say that I manage both my personal and professional life equally. And from my personal experience you don’t have to sacrifice anything to manage both your personal and professional life, but you just need to learn to manage both. I never appreciate sitting late in office, or working at odd time (except for production support projects or few rare occasions before a release). Its not because I am woman or need to spend time with my family, but I really feel that its not required. By doing so we are spoiling our work culture. Since the work timing in India is for 9 hours, the work should be managed within that time. If you are sitting late, that either means you are not utilizing your office hours properly, or the estimation is not done properly or you are not capable to do that work. The exceptions that happens once in a while can be easily handled with mutual understanding between you and your spouse. I do not have any support from my parent or in-laws and I have never asked for it. Its our (husband and mine) decision to have a baby in our life and not their's, so its should be our responsibility to take care of our baby. They sacrificed half of their life for their kids and now expecting them to spend the rest for their grandkids is really not correct in my opinion. And if somebody feel that they cannot handle both, then please prioritize and select one. Exactly my thoughts. I agree with you and Soumya. The choice to bring up a family is on both parents. So mothers maybe primary caregivers but they needn't be the only care giver. Their career is as important as their husbands. Soumya - great post and you know I agree with your thoughts. Women do have it harder when it comes to balancing work and home. I've seen a lot of professionally qualified women take a backseat, very bitterly albeit, after having kids. It is true that there are many professions where both the husband and wife just cannot maintain the same pace once they have kids. I know a surgeon and his doctor wife who are having a lot of issues now because the wife had to be at home with two young kids because you can imagine the schedule of a hot-shot surgeon. It's not as if the women want to, but many of them have to. Sometimes it is the family or society pressures and at other times it is too overwhelming when raising kids. So yes, we must try to help each other instead of judging who is doing what. I will never cease to feel grateful for my clients and my family who support me so that I can work and yet take care of my home. Soumya, this is so true. As I am also techie, I see this happening often. Roles are passed on to the men, plum opportunities seem to exist for the men only based on their networking skills. But, really, who is to blame here? The women have it bad at both home and workplace trying to meet expectations. That's so frustrating about workplaces. We have Equal Employment Opportunity laws here and employers are not allowed to ask questions about marriage/race/religion/sexuality thankfully. Having said that, I'm sure there are workplaces where sexism still exists. I think it's awesome you are assertive and continue to fight the good fight. We need more women like you and in higher positions as well. I can relate to this post completely as I have experienced it. Even though, the companies and teams that I worked with had major women force, still doubts/questions about their commitment towards work vis-a-vis families would always crop up. And this was when they had always gone beyond their call of duty, worked at odd hours and even on holidays and family functions. But when women themselves undermine themselves, that's truly disappointing. Sexism is a social evil that is so deeply ingrained in the society, that I feel like it will take a lot of time to overcome. That being said, I admire how you operate, Soumya, in your personal as well as professional life. More power to you girl! As far as I am concerned, I do my best to balance it all (but honestly, the balance is tipsy, on the best of days), but then so does my hubby. We are 100% partners, both having responsibilities at home and work. And we don't define roles or assign workload based on gender, but based on interest and ability.That works for us, so we stick to it. I manage work and family (somehow) and it only gets better with experience. Yes, there is very little time for myself and I end up having noone to talk to (with an all-male family ), I still get my stuff done and wind up with a wine at the end of the day. Being busy gives me everything I ever need in life. Ideally work shouldn't be any different for women, as we wrote the same exams to get those degrees which we share with our male counterparts. We did not have female question papers which were easier. We attended the same types of interviews and written tests where noone treated us any better than a male would be treated. So we have equal rights to positions based on our performance and capability. Our chromosomes should not decide our careers.